Park City High School’s Kirby Bayne, left, pushes toward the goal in a game against Logan High School last May. The Miners beat the Grizzlies 21-7, and went undefeated in Utah in their run to the title. 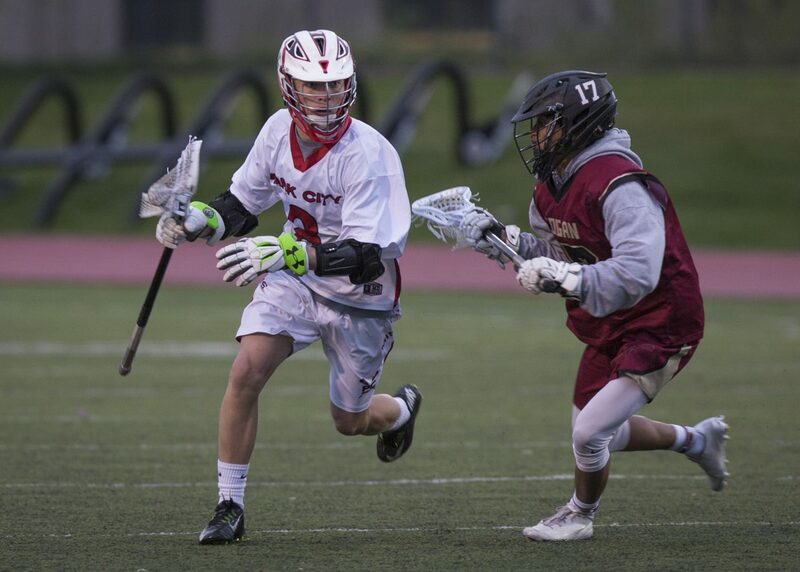 Lacrosse is set to become an official Utah High School Activities Association sport in 2020, and Park City is expected to maintain its dominance – though with different competition. Jon Oglesby, assistant director of the UHSAA, says all major hurdles have been cleared and the organization is on “a great pace” to introduce lacrosse in the 2019-2020 school year and that more teams are planning to join after the first season. Park City’s boys and girls teams are currently loosely associated with the high school, taking the “Miners” name and colors, though they are organized by the nonprofit Park City Lacrosse Organization, and play in the Utah Lacrosse Association, a statewide club league. Both the Miners boys and girls teams are at the top tier of the sport in Utah, having both won state championships in 2018 in the league’s top division, which is one of the reasons why the integration into the UHSAA was seen as both a gain and a loss for Park City Lacrosse. As a sanctioned sport, lacrosse teams will gain access to school funding – coaches will be paid through the district as will transportation and some equipment – but that funding comes with some restrictions. Players will be subject to eligibility constraints such as GPA standards, will have to live in the school district to play with the team and the teams will be subject to the same region structure as other sports. The latter point has been a concern for local lacrosse teams. Some worry that the switch to the region and class structure will make the Miners less competitive by forcing them to play most of their games against teams with similar student enrollment levels as PCHS, though the team has generally competed against the top teams in the state. That concern has not been entirely quelled. “The top four teams, which have traditionally we have played in the playoffs, are not in our (region), so we will have to play out of (region) to play those teams, which might be difficult to schedule during the regular season,” said Jen Hales, president of the Park City Lacrosse Organization board. Each team can play a maximum 16 games during the regular season, and with six opponents in their region for home and away matchups, (Region 2 consists of East, Highland, Judge Memorial, Olympus, Skyline, and West) that leaves just four non-region games. However, if the Miners make it to the post season, they have a good chance of meeting those top-level teams, such as Corner Canyon, Brighton and Herriman. The teams will be subject to the new Ratings Percentage Index (RPI) method that the UHSAA is rolling out for most team sports in the 2019-2020 calendar, meaning every team will be included in the playoffs. Also, the whole state (28 teams in four regions) will play in one single class during the first season. Based on first season performance, the teams will be split into two classes the following season – a more competitive and less competitive group. But despite concern about maintaining PCHS’s dominance, Hales is happy the sport is joining the UHSAA. “There’s definite positives,” she said. The inclusion will lessen the burden on parents who fund the entire operation currently, from transportation to coach salaries, referee and league dues, and equipment. Hales said sanctioning will also make the sport more visible and credible. She said people are often confused about the nature of Park City Lacrosse, since it looks like a high school sport to spectators, but isn’t actually funded by the school district. She said it will also allow the school’s lacrosse teams to be more easily ranked against other teams in the U.S.
Students will get athletic credit for participating, and the teams will be compared apples-to-apples to other high school teams around the nation by organizations like MaxPreps, which handles the UHSAA’s season records, and continually stacks teams up with others in the state and nation. Once the UHSAA sanctions the sport, PCLO will cease to exist. The all-volunteer board (usually about five to seven people per gender team) will be dissolved and it will be up to coaches to pick assistants and parent volunteers. The coaches for the 2019-2020 season will be chosen by the school district. Sheetz has already posted job listings, and both Brian Bilzi, the current boys lacrosse head coach, and Zach Sadoff, the current girls lacrosse head coach, said they plan on applying for the positions.